Hoped the sucker would be paid off by now, but celebrating progress. 992.41 left on my credit card. Bought a house with my bf. Speeding Ticket in March for $178. Bought a new computer for 1550, sold old one for $1004, minus 112 in Paypal fees and like 30 in shipping costs that I ate. Booked a flight to New York in October. 300, bf paid half. Becoming more sociable / going out for lunch, dinner, etc. Interest is continuing to accrue on the student loan. I’m going back and forth about whether I should do Income Based Repayment again this year. The annual interest of 1785 with my current balance is a bit of a deterrent. 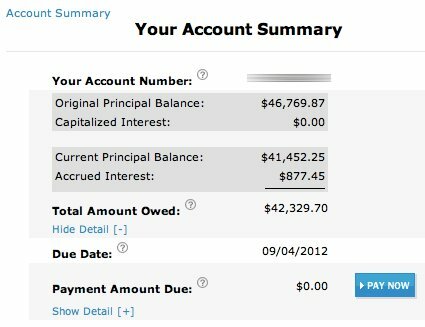 If I am able to pay 1/3 of my principal balance next year rough estimate I could save 500-600 interest. Translated into work terms, that’s roughly getting a week’s pay back. I’m thinking of leaving my job after the next 6 months. It will mark a year, but my income really isn’t high enough to support my lifestyle without continuing to make major sacrifices. At my age I should be earning at least 40k/annually and based on the informal research I’ve done, I would need 2 promotions for that to happen. With the first “promotion”, a pay raise isn’t necessarily guaranteed. I don’t think the managers even make 50k. I do need a game plan though. Building skills, networking and coming up with my own career path and being super proactive in the search.